I love this picture more than I can say. Went to my very first Sara[space]Bareilles concert last night and was blown away. 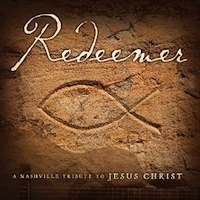 Even though I’ve always appreciated her talent, and why David’s such a big fan of hers, I never REALLY listened to her music until my David-less Lent this year. Newsflash: Her songs are amazing 🙂 … full of soulful, poetic goodness. And her voice, wow. Unlike David tours, though, I had no idea what songs she’d sing or what kind of show she’d put on. So what an incredibly lovely surprise it was to get to the venue (which I’ve been to before and it’s always a general-admission, stand-all-night kind of place) and (a) Sara had arranged for rows of folding chairs for everyone; (b) there was NO opening act! So Sara popped out from behind the curtain promptly at 8 to huge cheers; and (c) there was NO band. Just Sara. WOW. She played piano and sang, played guitar and sang, played an odd sort of harmonium box and sang. Invited a stranger up from the audience (a lovely girl from Montreal) to sing a song with her, and because the girl was so incredibly good, Sara basically just played piano and let the girl belt out the whole song on her own. 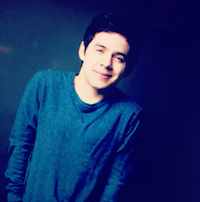 Jul 13, 2009 by Jared SmithI flew into Los Angeles today and accidentally assaulted David Archuleta in the process. I was seated in the front, bulkhead row of cabin class and when the plane stopped at LAX, I stood up, squeezed through traffic, pulled down my bag from the overhead compartment, and then tried to back into the galley area right by the exit door. I didn’t realize that while I was getting my bag, David had come from First Class and had occupied the area immediately where I was backing. I smacked him pretty hard with my backpack. Of course this is perfectly understandable because in real life David is roughly the height and build of Frodo Baggins. I now realize that if I’d have been paying attention, I would have realized something was up before we landed. Apparently everyone on the plane but me knew he was in first class. I suddenly realized that the stench of estrogen was strong in the air and that every female was now mobbing to get a glimpse of him. I was literally being pushed toward him and he was being pushed, by me, into a corner. I’d like to say that I was filling the role of his bodyguard by shielding him from the onslaught with my body, but I really didn’t have control over the situation. (He was, by the way, totally alone.) We were inches apart and face to face… well, face to neck/chest/breast area maybe. 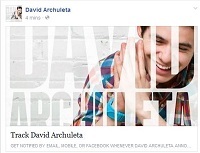 I COULD SMELL THE AIRLINE PEANUTS ON DAVID ARCHULETA’S BREATH! The flight attendant then opened the plane door. We then exited the plane where we were both mobbed by teenage girls who kept asking us for pictures… or more specifically, asking me to take a picture of them with David. I think they thought we were together – probably brothers… or something like that. He was very gracious and even thanked me a couple times for taking pictures of other people with him. I did sneak one quick picture in before he literally RAN through the terminal to get away from the growing mob of giddy teenage girls and middle aged mothers. 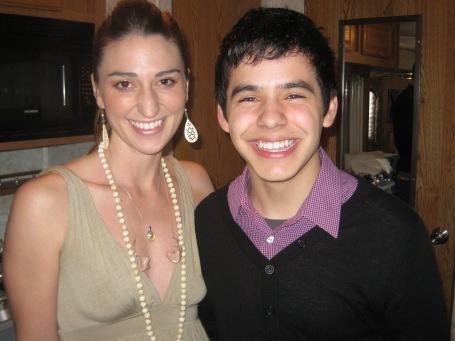 This entry was posted in Concert recap and tagged David Archuleta, Sara Bareilles. Bookmark the permalink. LOVED this story, I remember reading that long ago and had forgotten it. “Get back you devil women” lol. Oh Amber, what were you going to say to rat out your big bro? Love that gif. Well thanks TOfan, that is all refreshing and endearing this morning. I suddenly realized that the stench of estrogen was strong in the air and that every female was now mobbing to get a glimpse of him. This kills me, I cannot with this lololol. Haha, I don’t remember reading about this airplane incident (although I may have at some point). Got all the details in there even the ‘peanut breath’, lol. Quite the storyteller, too funny! So nice that you saw Sara(space)B in concert TOfan, a terrific artist. 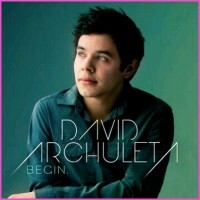 Sounds like a great concert and yes, I would love to see David do that type of show too, would be awesome!